This super soft quilt is made using over 32 different cotton lawn fabrics, I lost count as I was cutting them into 4″ squares. I have been collecting the cotton for many years some of the are Liberty cotton lawn and others City Cotton a manufacturer I find producing the loveliest cotton lawns. I randomly pieced the square only changing a square if two exactly the same ended up together, I did leave any that were the same design but a different colour. I wanted the quilt to be reversible and found one of my vintage sari’s in just the right colour, it is made of shot satin so was slippery. 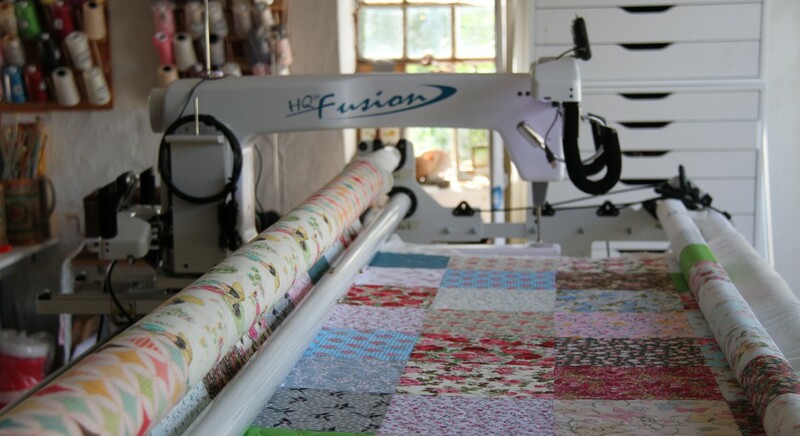 I decided that as the quilting would not really show on the patchwork side of the quilt that I would quilt it back to front with the top on the bottom and the backing on the top, I was not sure how my machine would handle this but Daisy Longarm was great and I had no problems at all. < New quilts in the QuiltedCloth store.